The new Palm Pre is also arriving with a handful of nice accessories in tow. Some of them are the standard chargers and cases that come with any new device release but some of the others merit particular attention. 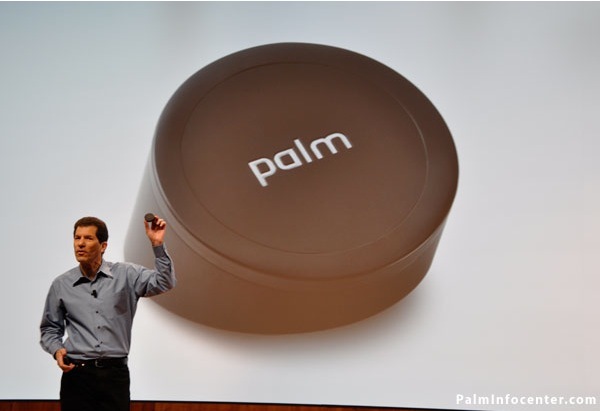 Palm ended their presentation today with a nice surprise that is by far the main accessory news related to the Pre. Resembling a hockey puck with a severely sloping front, the Touchstone is a charging dock that permits wireless recharging of the Pre via induction technology. The Touchstone looks to compliment the Pre with its sleek, black, iconic look. Its interesting to see the innovation carry over to the typical afterthought that is a docking cradle. Jon Rubinstein briefly explained the interaction and user-friendliness of even a simple desktop dock like this with the Pre's WebOS. If a call comes in while the Pre is docked on the Touchstone, the user can answer the call and have it automatically enable speakerphone mode or if you prefer it will auto answer the call when picked up from the device. A new case, identified only as the "Pre Slip Case" and the Vehicle Power Charger (apparently the same adapter released previously for the Treo Pro and also backwards compatible with the 800w) are fairly self-explanatory. ...and have "wireless charging" on my Wii remote. Is this REALLY worth mentioning as more than an aside? Yes, trust me. If you don't trust me, then trust Ryan. This is an UEBER-COOL accessory and could potentially spawn a host of knock-off devices. I have no idea on its MSRP but it's brilliantly designed and executed. The perfect executive desktop status symbol for 2009 and beyond, just like how the sleek palm V sitting in its cradle was the status symbol of 1999. You can? Is Sanyo actually selling it? It's especially nice for the Wii since none of the other rechargers I know of work with the silicone sleeves in place. So, does that mean the Pre has induction charging capability built-in? Oh, okay, that's the one. > ...So, does that mean the Pre has induction charging capability built-in? It means it is an extra-cost accessory (different back, I believe). Don't worry, I do. I agree - it's a beautiful thing and will make for a great "look how much money I have to waste on uber-cool toys!" status symbol. That's too bad induction charging does not appear to be built-in. But, I believe you're right, it does seem to imply a different back is required on the accessories page. I could easily see some clever 3rd party induction chargers getting developed if it was on all the devices. Kind of funny, they never show a picture of the Touchstone with the cord that obviously goes to the outlet. are "forgetting" to mention that the induction charging is an extra-cost item. That Wii remote charging station and, it appears, TWO battery packs is about $35 on Amazon so we can estimate that the Pre thingee will be at least that much, right? so it looks like you have to put on an "inductive back" on your Pre to use this touchstone? does the inductive back change the shape/thickness etc? does the inductive back come with the touchstone? > ...does the inductive back come with the touchstone? So let me clear this up a bit. Yes, the touchstone does require a special back for the inductive charging. The one they are using at CES seems to be the same size and has a black soft touch finish to it. It will be included when you buy the touchstone. The touchstone itself affixes to a desk or surface via a very strong suction cup and it clasps the Pre to it via a magnet. it makes sense to sell the inductive back separately from the touchstone. why? because i may need 2+ touchstones - 1 for home, 1 for work etc. but i will only need ONE inductive back. so why bundle them? "...1 Requires Palm Pre back cover for Touchstone charging dock, sold separately...."
That sounds to me like the Touchstone is sold seperately, not the back. > That sounds to me like the Touchstone is sold seperately, not the back. You have a language problem. Where did you say you came from again? Just like my electric toothbrush. Yep, and like my 10 year old Panasonic shaver it's probably a pretty slow charge. I don't use a cell phone, my Centro is just my alarm clock now running PalmaryClock v3.5 to wake me in the morning. My Tx will hold a charge for maybe half an hour and is only used to test microphones. My Lifedrive is like new, never gets used. About a dozen PVx like new, never get used. Palm Pilot, PIII, Visor, gathering dust. I don't think I'll give Palm any more money! I love my 1st gen iPod Touch! Now that's an OSX Computer you can carry in your shirt pocket! Is it THAT settled on that point? Are you saying this AFTER looking at the Mojo hype at the Palm dev site? Or are you just thinking Palm web apps = iPhone v1 web apps? I still wonder if this is mirroring the iPhone. Web apps first, real SDK later. > ...I still wonder if this is mirroring the iPhone. Web apps first, real SDK later. I thought I read in one of the ten thousand Me-Too Media articles that Palm explictly said exactly this. 'Later' from Palm, heard that before. ...plugging them into chargers, thus the "lay it on instead" Touchstone. no - market differentiator. and ruby loves him an ecosystem!